Beneath the charming cobblestone streets of Cheesebridge live the Boxtrolls; quirky, mischievous and cardboard box wearing creatures who crawl above ground at night to scavenge for bits of human junk. The Boxtrolls love nothing more than cheese and an orphaned baby boy named Eggs (Hempstead- Wright) whom they have warmly raised since his infancy as one of their dumpster-diving, junk collecting own. Despite their timid, good-hearted nature, the Boxtrolls are feared by the people of Cheesebridge, who believe they will steal their children and beloved cheese. Eager to win over the town’s affection, evil pest exterminator Archibald Snatcher (Kingsley) and his crew of Red Hat exterminators develop a plan to eradicate the kindhearted band of tinkerers. It’s up to Eggs and his feisty new friend Winnie (Fanning) to bring the two worlds together amidst the winds of change - and cheese. Starring Academy Award winner Ben Kingsley ('Iron Man 3', 'Hugo'), Isaac Hempstead-Wright ('Game of Thrones', 'Closed Circuit') and Elle Fanning ('Maleficent', 'We Bought A Zoo'), 'The Boxtrolls' is an original family film that proves heroes come in all shapes and sizes. Featuring an all-star support cast including Academy Award nominee Toni Collette ('The Way Way Back', 'Little Miss Sunshine'), Jared Harris ('Mad Men', 'Lincoln'), Nick Frost ('Cuban Fury', 'The World’s End'), Tracy Morgan ('30 Rock', 'Cop Out') and Simon Pegg ('Shaun of the Dead', 'Star Trek'), 'The Boxtrolls' is a hilarious adventure for the whole family. The 'The Boxtrolls' competition has now closed. Winners will be announced shortly. Competition opens at 5pm AEDT on Sunday 11th January 2015 and closes at 11:59pm AEDT on Sunday 18th January 2015. Ten winners will be chosen at random on Monday 19th January 2015. To successfully win, entrants must fulfil the above entry conditions before the time the competition closes. Current members/followers are eligible to enter the competition. Only one entry per person. Only one winner per household. To be a valid winner, the entrant must not have won a prize from SWITCH within the last 28 days. Each winner will receive one Ultraviolet Blu-ray copy of 'The Boxtrolls'. By entering, you agree to receive occasional emails from SWITCH in the future. If you decide to unsubscribe from these updates, any further entries will not be applicable. Only Australian residents are eligible to enter. 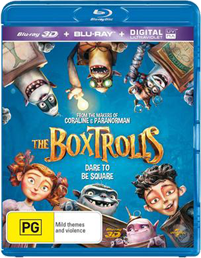 'The Boxtrolls' is available on Digital, Ultraviolet Blu-ray and Ultraviolet DVD on Thursday the 15th January 2015 from Universal Sony Pictures Home Entertainment.